‘PEST’ is an easy acronym to remember these crucial components because if even one is missing disease will not threaten yield. Image 1. 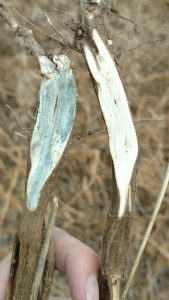 Cut soybean stems. The right is healthy while the left is covered in microsclerotia, the overwintering structure produced by Macrophomina phaseolina. Screening is therefore essential in order to know if a pathogen is present in your field so that you can know when it is necessary to incorporate management options into your integrated pest management (IPM) field practices. See p.8 of our Soybean Disease and Nematode Identification Field Guide here for symptoms and management options for this disease. Right now we are in the midst of a large-scale screening project for charcoal rot and soybean cyst nematode across West Tennessee (see previous blog articles Soilborne Pathogen Screening and Free Soil Testing for Pathogens). But how do we actually screen the soil and root samples we receive from fields for charcoal rot? A careful process of collecting, grinding, sterilizing, and plating samples on nutrient-rich media yield the amount of charcoal rot in CFUs (Image 2), or colony-forming units, that are quantified per gram of soil or root. Image 2. 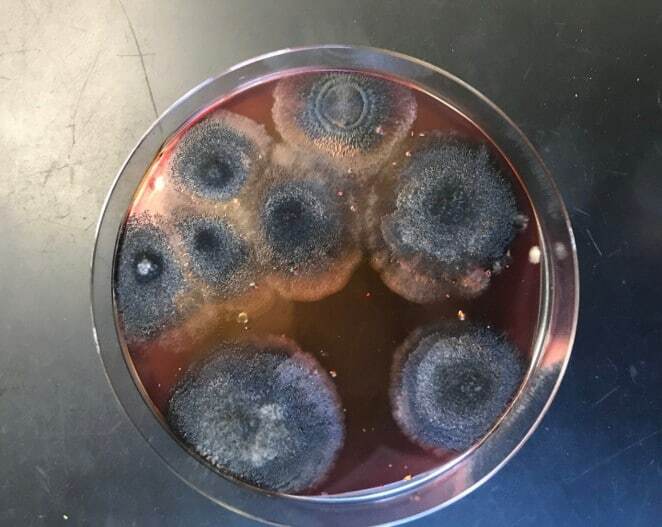 CFUs (colony-forming units) of Macrophomina phaseolina grown on nutrient-rich media. This allows us to extrapolate the CFUs from each sample to eventually estimate the potential yield loss for a given population of charcoal rot present in a field. In 2017, paired soil and root samples from 10 sites were screened for Macrophomina phaseolina from Gibson and Madison counties (Image 3). Image 3. CFUs of Macrophomina phaseolina from soil and soybean root tissue from 10 sampled sites in 2017. While all sites were positive, amounts of charcoal rot varied not only by location but also between root and soil samples, which can be expected. Returning to the plant disease pyramid, differences in susceptible hosts (crop varieties) and environmental conditions (e.g. soil textures) will affect the potential for a disease to affect yield. We are still collecting soil samples for this project through the end of the year. For more information, see previous article Free Soil Testing for Pathogens or contact your local county agent or Heather Kelly, Plant Pathologist (UT), by email (youngkelly@utk.edu) or phone (731-425-4713). Thank you Rachel, this is very informative.